Rubber Bands are known for holding things together, and are also fun to shoot at each other. But did you know there are many other uses for the little contraptions that have become a universal household name? 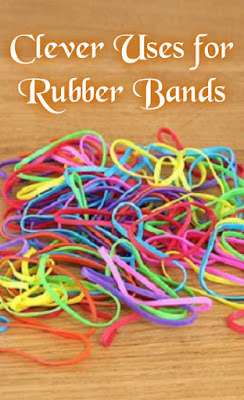 In case you didn't know, here are some other practical uses for rubber bands you may find helpful in everyday life. 1. Keep teabag tags out of your tea. Simply place a rubber band around the mug securing the strings and tag. 2. Help prevent a sliced apple from turning brown. If you need to slice an apple for some time prior to eat being eaten wrap a rubber band over it to keep its shape and from becoming exposed to air. 3. Create a gripper to help open tight lids. Wrap a band around a bottle top or can lid to help get a better grip for opening. 4. Keep packaged foods well sealed. Keep cereal, nuts, and other bagged foods fresh by folding the top of the bag over and then wrapping a band around the whole thing. 5. Prevent a cutting board from slipping. If the board is sliding on the counter surface, wrap a rubber band around each end. Now, it will hold steady as you cut. 6. Help young children hold a glass. Slip rubber bands around a drinking glass to help children get a better grip. 7. Convert your broom into a swiffer. Secure a cleaning cloth to a long-handled broom with a large rubber band to clean hard-to-reach high places. 8. Bookmark. Wind a rubber band around the last page you read in your book to simply pick up where you left off. 9. Temporary leak fix. Wrap a fat rubber band around the hole in a pipe or hose. This will help slow the leak. 10. Catch candle wax. Wrap a large rubber band around a candle to stop wax from dripping onto the table. 11. Pencil gripper. Simply wrap some rubber bands around the area of the pencil where you like to hold it creating more comfort. 12. Keep clothes on hangers. Attach rubber bands around the ends to keep clothes from slipping off. 13. Secure pants that need to be loosened. Whether you overate a little or have a little one on the way your usual fitting pants may be feeling tight around the tummy. To help loop a rubber band through your fly to give your pants a little extra elasticity. 14. Extend the life of your liquid soap. Wrap a rubber band around the top of a pump bottle, so that the dispenser pump only goes down partway. Each pump will yield half as much soap—still plenty for getting hands clean—so you use less soap. 15. Organize your desk. Secure loose items together such as pens, pencils, markers, and other items together. 16. Shorten cords. Simply wrap a band around the excess to shorten them. 17. Prevent paint from dripping off a paintbrush. Before starting your paint job stretch an extra large rubber band across the paint tin. Use it to wipe off any excess paint from your brush. 18. Remove a stripped screw. Place a rubber band over the top of the screw and then using your screwdriver you will be able to remove it easily. 19. Childproofing cupboards. Simply wrap bands around the knobs tightly to prevent small children from opening the doors. 20. Adhesive. If you find yourself in a pinch and need to glue something quickly you can melt some rubber bands. 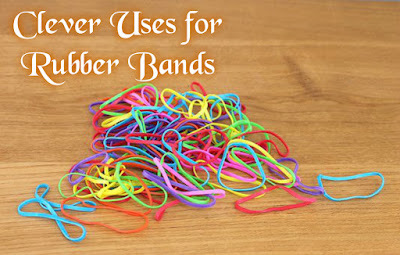 Do you have any clever uses for rubber bands ?